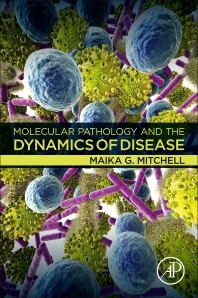 Molecular Pathology and the Dynamics of Disease bridges the basic science of, and primary clinical literature on, human disease. Topics covered include several major disease areas, such as inflammation and host response, vascular disease, obesity, weight regulation and appetite, cancer biology, drug development, and gene- and cell-based therapeutics that are all presented in a way that emphasizes the interplay between clinical care and investigation. As new technologies and techniques are constantly changing and laboratory scientists plays a critical role in validating data used by clinicians in diagnosing patients, this book provides a timely guide that includes a clinical, research and theory perspective. The lead scientist and principle author in numerous studies involving tumor immunology, Dr. Mitchell has current teaching experience in anatomy and physiology, including recognition for contributions to research development, revenue-focused product development and management of high-tech operations. She is a contributor to the NCBI SNP database for pediatirc and urological cancers. Dr. Mitchell has been a research scientist for well over 17 years in the biomedical field, most recently as Senior Director of Research & Development in Greater New York conducting flow cytometry and molecular-based assays in conjunction with bioinformatics.